Jose Quintana is a neat pitcher. He’s not a dominant ace in the traditional sense. As Dave Cameron describes it, he’s much more steadily excellent than dynamically charged. He’s so steady, in fact, that you could pick any season from the last four years and probably not tell what year it was. While that’s impressive in its own right, something from his 2016 might say he could still take it up a notch. Last year, for the first time ever, Quintana generated more than 16.7% soft contact. That correlates with a big jump in hitters making contact on pitches out of the zone. It might also suggest he was getting guys to swing more at offerings out of the zone…but he wasn’t. That hints at something pretty cool: that he was throwing the same stuff as before, but sequencing in such a way that got hitters to take more misguided cuts. Weaker contact doesn’t inherently equal less hits allowed, but it’s more desirable than any other kind of contact. 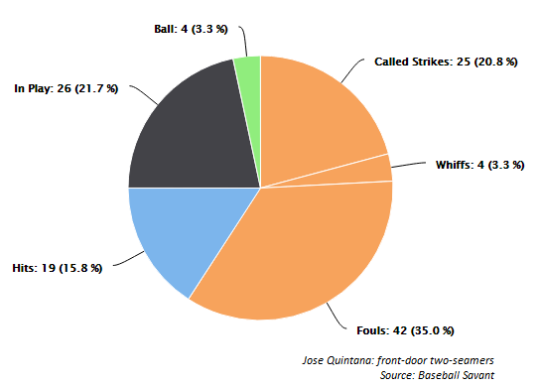 Quintana’s contact profile last year had the largest impact on fly balls. He induced a career high 38.7% in 2016. While that’s nice, it didn’t dramatically impact his overall stats, and contact numbers in general aren’t necessarily predictive. But for Quintana, these results might be pointing him in the direction of increased success. He relies most on three pitches – a four-seamer, a two-seamer, and a curveball. All of them rank in the top ten in baseball over the last two or three years. In particular, using his two-seamer more deliberately is what could pay dividends. The front-door two-seamer is a deceptive pitch that makes batters think it’s going to be inside, only for it to cut over the plate at the last second. Its purpose is to get a hitter to take an offering that’s actually a strike. Quintana did this 120 times in 2016, getting a strike at a rate of nearly 60%. On all his other two-seamers, he got a strike only about 40% of the time. The sample size is small but suggestive. Combined with his contact profile last year, which suggests hitters grew more unsure of when to swing against him than in years prior, and that he throws the pitch just as hard as his four-seamer, additional front-door two-seamers from Quintana could really mess with hitters something fierce. Overall, I’m unsure whether an increased amount of front-door two-seamers would be more likely to lead to increased soft contact or strikeouts for Quintana, though I think it stands to reason they could improve his overall numbers given his track record. It’s also worth noting that he already throws the pitch, and throws it well, meaning he doesn’t have to make major adjustments to implement it. At the least, more front-door two-seamers would create another shade of nuance in his game. They would certainly help keep him interesting to watch. How Are So Many Comics On TV?